Normally fish regulate their buoyancy by using an air filled sac located near their stomachs called a swim bladder. A fish can decrease air to sink or add more air to float. However, with deep water fish, a swim bladder is not necessary. Sablefish are a great example of a deep water fish that does not have a swim bladder; instead they use oils in their flesh to regulate buoyancy. Due to this interesting life strategy, Sablefish meat is very rich in oils including the healthy Omega-3. Having such high amounts of oils creates the delicate and buttery flavor found in all Perciformes Sablefish! Heather King is an aquaculture technician at Perciformes Group, LLC. She attended the University of Massachusetts Amherst where she received a Bachelor of Science degree in natural resource conservation. After graduation, Heather was a part of the aquaculture team at the University of Southern Mississippi’s Gulf Coast Research Laboratory where she cultured spotted seatrout (Cynoscion nebulosus), red snapper (Lutjanus campechanus), and tripletail (Lobotes surinamensis). Her experience in the culture of tropical marine finfish as well as knowledge of aquaculture system constructs brings a unique skill set to the Perciformes team. Lorenzo M. Juárez is COO for Global Blue Technologies, Ltd. and its affiliates Perciformes Group and Prometheus Progeniture Genetics Technologies, Ltd. He has been a consultant for the worldwide shrimp industry and worked for two years as Chief Operating Officer for Yorktown Technologies, a company that incorporates biotechnology and fish farming for the production of ornamental fish in the US. Previously he spent 2 years in Baja California, Mexico, as CEO of Baja Aquaculture, Inc., a US holding with companies that farm marine fish and oysters in Mexico, and manufacture offshore farming equipment in Maine. During 2010–2013 Lorenzo was deputy director of the office of aquaculture at NOAA’s National Marine Fisheries Service in Washington, DC. The bulk of his experience stems from 25 years managing shrimp hatchery and breeding operations in the USA, Latin America, and Asia. He was president of Shrimp Improvement Systems (SIS), a leading shrimp breeding company and worldwide supplier of genetically-improved broodstock. He was country director of Sygen’s shrimp breeding company SyAqua, overseeing their Mexican concerns and coordinating with operations in Hawaii, Singapore, and Indonesia. Between 1989 and 2003 Lorenzo worked for the US-Honduran group Sea Farms International, at the time the largest shrimp farming company in the world. Lorenzo has a master’s degree in Aquaculture from Auburn University and a B.Sc. from the Monterrey Institute of Technology in Mexico. Throughout his carrier he has written extensively about his experiences with shrimp hatchery operations, selective breeding programs, offshore mariculture, and about aquaculture and environmental sustainability. He has published numerous works in peer-reviewed journals and trade magazines, including two chapters in a 2010 book summarizing advances in shrimp farming. Lorenzo is a past president (2009) and a fellow (2011) of the World Aquaculture Society (WAS), and a past president of the Mexican Association of Shrimp Hatcheries (2003). He also founded and was first president of the Mexican Association of Marine Fish Farmers (2014). Lorenzo lives with his wife Rosa in the greater Tampa Bay area in Florida. Dr. Tim T. Aberson is an accomplished health practitioner and financial resource expert. His interest in health and nutrition led to his involvement in the future of aquaculture technology and its place within the environment. His belief that Recirculating Aquaculture Systems (RAS) technology can and will play a significant role sourcing quality marine protein, improving the world’s oceans by diminishing overfishing and by-catch waste, and becoming a sound financial profit center, led to his full time involvement in sustainable aquaculture development. Dr. Aberson serves as President of Perciformes Group as well as Investment Director for Global Blue Technologies and its affiliated companies. Additionally, Dr. Aberson recently took on a new role as President and CEO of Prometheus Progeniture Technologies, Ltd., which is focused on building and operating the most globally important and scientifically comprehensive, wholly-owned genetics research and development center for marine protein. 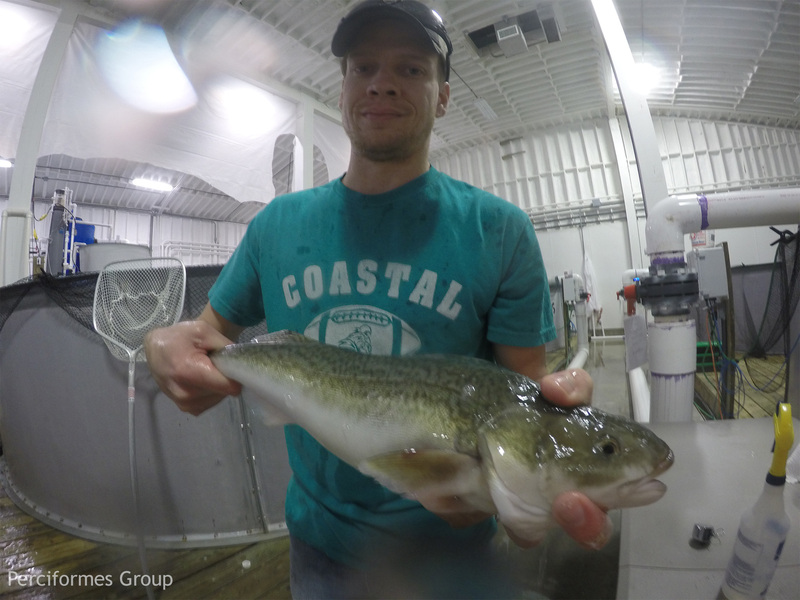 Eric Schnatter is an aquaculture technician at Perciformes Group LLC. Eric gained valuable field experience while attending the Carteret Community College and working with Hubbs-Seaworld Research Institute. During his previous experiences studying and working at these facilities, Eric has designed, constructed, and maintained recirculating aquaculture systems. He also gained valuable knowledge in culture high value marine finfish. Some species include Cobia (Rachycentron canadum), and White Seabass (Atractoscion nobilis). Eric brings a unique skill set to Perciformes by providing knowledge in the culturing of marine finfish as well as system maintenance. Dylan Black is the operations manager at Perciformes Group. He attended Texas A&M University at Galveston where he received a Bachelor’s Degree in Marine Biology. Dylan has experience in building and designing aquaculture systems along with many production techniques to grow fish in an economically and environmentally sound manner. Tiphanie Dillion is an aquaculture technician at Perciformes Group LLC. Tiphanie’s expertise lies in live feed culture, which is a critical aspect in the larval rearing process in marine finfish. She has single handedly developed and run numerous live feed programs. She is also well versed in the larval rearing of marine finfish from broodstock husbandry, to spawning, to nursery husbandry. Christopher’s responsibilities include all aspects of the aquaculture program at Perciformes Group LLC. This includes designing recirculating aquaculture systems and production methods, as well as, overseeing the day to day operation of the research and development facility. He earned a Masters of Science in Coastal Science specializing in marine aquaculture from The University of Southern Mississippi (USM). John Henry Francis is a Researcher for Perciformes Group. His educational background includes a Bachelor’s of Science in Marine Science from Coastal Carolina University and a Master’s of Science in Coastal Science specializing in Chemical Oceanography from The University of Southern Mississippi (USM). John has numerous experience in growing marine protein ranging from shrimp to finfish.